Ned Lamont, left, and Joe Ganim face off for their first Democratic gubernatorial debate on Thursday in New Haven. 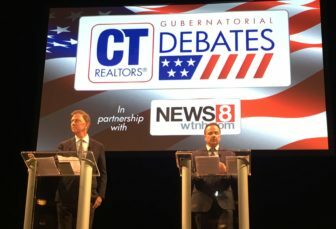 New Haven — Democrats Ned Lamont and Joe Ganim went head to head for the first time Thursday in a debate full of feisty jabs and bravado infused with talking points on who would be a better candidate for governor of Connecticut. The one hour face off before a large crowd at the Shubert Theatre touched on topics ranging from previous experience, to education, to gun control, and restoring the public’s trust in government amid the state’s fiscal crisis. Lamont, 64, is a Greenwich businessman who unsuccessfully sought the governor’s office in 2010 but won the party’s endorsement in May. Ganim is Bridgeport’s mayor who served seven years in federal prison for corruption in the office when he held the post 20 years ago. Lamont said the state doesn’t need another legislator or mayor leading Connecticut, but a governor who has started a business and created jobs. Lamont said he would be fearless in challenging the status quo and shaking up the way things are done in Hartford. 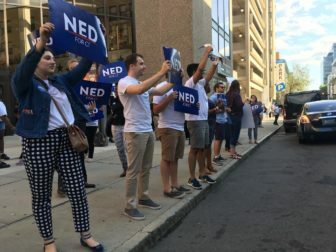 Supporters for Ned Lamont stand outside the Shubert Theatre in New Haven before the Thursday debate. Ganim’s conviction on 16 felony counts came after the mayor’s involvement in a systematic scheme to extort kickbacks from people who did business with Bridgeport during his first tenure as mayor. In responding to a question on how the public could trust he wouldn’t return to his former behavior, he was quick to say he “greatly regretted” his past corruption, affirmed he learned from his mistakes and is ready to make another contribution to public service. Lamont was forgiving in his reply, and rather than condemning his opponent for his past conduct, he saluted the people of Bridgeport for giving him a second chance after he badly abused their trust. “And I would say they gave you a second chance, now fight for them, finish your term, turn around Bridgeport,” Lamont said as he drew loud applause from the crowd. Both candidates stated support for tough gun control. Lamont said he would be serious about addressing untraceable firearms called ghost guns and placing more social service people in schools. Ganim said he goes back decades in taking on the NRA and said no child should their leave home with a concern about school safety. Ganim needled Lamont with pointed criticisms, including his continual challenge of Lamont’s ability, as a millionaire, to understand poorer voters and for his relatively slight political experience. People supporting Joe Ganim cheer for him with signs ahead of the debate in New Haven on Thursday. 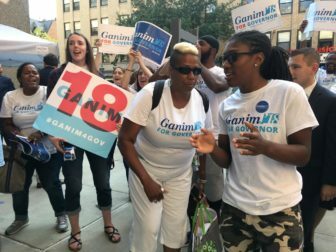 Ganim conceded that he grew up in a great home, “but I can tell you this, we had eight children in our family, but we never had eight bathrooms.” It was an allusion to a jab earlier in the campaign about the number of bathrooms in Lamont’s palatial Greenwich home. The two agreed on the need for paid family medical leave and raising the minimum wage to $15 and hour. “It’s in the best interest of your company, the best interest of the state, not just that single mom, that she have the opportunity to take care of a sick person, give birth to that child as well as to be able to continue working,” Lamont said. Lamont said that a $15 minimum wage would make a world of a difference for parents in places like Hartford or Bridgeport. Lamont became a national figure when he defeated Joseph I. Lieberman in 2006 as an antiwar candidate but later saw Lieberman win as a petitioning candidate that November. He badly lost a Democratic gubernatorial primary in 2010, despite outspending then Stamford Mayor Dannel Malloy. Thursday’s New Haven debate is the first of four Democratic face-offs scheduled before the Aug. 14 primary.